The Augusta Museum of History offers a variety of tours Monday through Sunday. They are either docent-led tours or self-guided tours for both adults and school children. Docent-tours and tours on Tuesday and Wednesday must be scheduled at least three weeks in advance by calling the Museum at (706) 722-8454. Special needs and/or interests for your group will be considered. For docent-led school groups, the Museum can accommodate up to one hundred children at one time, in groups no larger than twenty-five students. Larger school and adult groups are welcome, but would be self-guided. Through a guided tour of the award-winning exhibition, Augusta's Story the history of Augusta is traced from the regions earliest inhabitants to modern day. Also included in this tour is The Transportation Corridor, which highlights 150 years of transportation history in Augusta, including a 1914 Steam Engine. The second floor of the Museum covers such popular history topics as golf, local legends, military and medical history, Mr. James Brown, and the Georgia Railroad Bank. Local and regional history comes to life for children as they interact with selected subjects by touching and using historical reproductions. By comparing the past to the present, children learn more about their world. A more in-depth examination of Augusta area history is provided to students as they study the events and forces of the past 12,000 years that have shaped their community. The Museum offers a specialized tour with an interactive craft. Examples include: visiting our Stallings Island exhibit, examining materials on the Native American Touch Cart, and then creating pottery; another is touring the Civil War exhibit, then using quill pens to copy letters in Spenserian script. Both craft and tour can be custom made. The minimum size for the group rate is 10 people. The group rate is $2.00 per person. 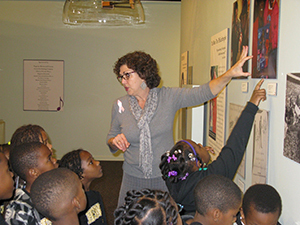 Docent-led school tours can accommodate 100 students in groups of 25. Kindergarten and 1st grade should have one adult/chaperone for every 6 students, older school groups should have an adult/chaperone for every 10 students. Teachers and chaperones are responsible for supervising the students. Groups of 10 or more who wish to schedule tours may call the Museum at 706-722-8454 or e-mail: education@augustamuseum.org Tours must be scheduled one week in advance for self-guided tours and three weeks in advance for docent led tours. As of January 2016, AMH is pleased to announce that docents will be available to lead tours Thursday through Sunday with the cost of admission. This service is included with admission and is subject to the availability of docents: $4/adult, $3/senior, $2/child, 6 and under free. The Augusta Museum of History offers an audio tour for the exhibit: Augusta's Story. This tour allows visitors to use QR codes to create their own museum experience. Simply download a free QR code reader on your phone, look for the Audio Tour labels, scan the code and learn something new! These Audio Tour QR codes are posted at various points throughout the exhibit and can be viewed in an order desired. To hear an example of what our Audio Tour is like click below. 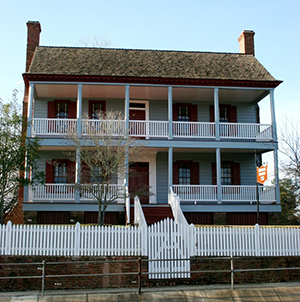 The 1797 Ezekiel Harris House, said to be "the finest eighteenth-century house surviving in Georgia", is located at 1822 Broad Street and is an excellent example of early Federal architecture. Fully restored in 1964 and listed in the National Register of Historic Places, the Ezekiel Harris House is a reminder of the days when tobacco was the primary cash crop of Georgia. The Harris House is open on Saturdays from 10 a.m. to 5 p.m., with last tour starting at 4 p.m. All visitors receive a guided tour. Visitors who wish to visit the house on other days must call in advance and the Museum will make arrangements for a tour. The cost of admission is $2/adult and $1/child. For more information, please call (706) 722-8454, e-mail education@augustamuseum.org, or click below.